To celebrate BMW’s 100th Anniversary, we will be joining BMW CCA Puget Sound members for a huge gathering of BMW cars and motorcycles at the Haub Family Field, adjacent to LeMay – America’s Car Museum (ACM). 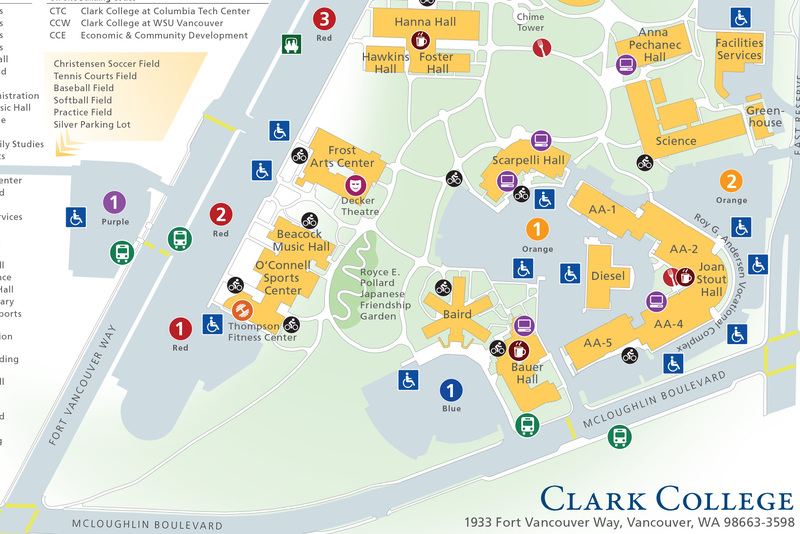 BMW CCA Oregon members will meet at **7:00 AM** 8:00 AM at Clark College (Lot Red 1 – see map below) in Vancouver, Washington with the mandatory drivers meeting at **7:10am** then departure at **7:15 AM** 8:30 AM. Please remember to fill up before you arrive, as we will not be making any stops along the way. Miss this event and you’ll have to wait another 100 years for the next time! Admission to the CCA event at LeMay is $15 per vehicle *pre-registration* and $20 per vehicle *day of event*. If you are driving up from Vancouver in the caravan, you will need to register with the Oregon Chapter MSR and also the Puget Sound MSR. One registration is for insurance on the drive up, the other is for actually registering to the event. 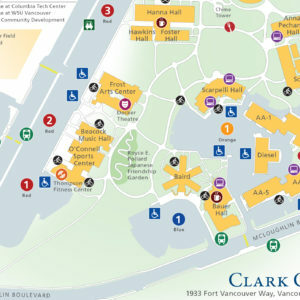 Don’t forget that we are meeting at Clark College in parking lot Red 1. View the map for details. We plan to fill the entire display field with BMW cars and motorcycles. Cars will be parked on the grass in the center of the field, and around the edges. Parking will begin by 9:00 am at ACM rain or shine. Our goal is to have as many people as possible drive to this event and park their BMWs on the display field. The big display field is for you, the members of the club, to simply park your cars and hang out with other BMW drivers. There will be no judging; we just want lots of BMWs and their owners to come out for a big birthday party! Note on the schedule that we are serving cake starting at 1:00. This won’t be just any cake. These will be cakes with roundels! Yep, real official BMW birthday cakes. ACM is discounting admission to the museum for all entrants. The swag for this event is going to be epic. While supplies last, each entrant of a BMW will receive a special BMW Centennial commemorative hat. But there’s more! Entrants will also receive an event poster, commemorative tote bag, commemorative refer magnet and window decal with the BMW Centennial Celebration artwork (all items limited to supplies on hand). Miss all this cool stuff and your life may cease to have meaning. You need to be there. This event is open to all BMW owners/drivers. Almost Free! Pre-registration is only $15 per car. Day of event registration is $20 and on a space available basis. Only those who pre-register will be guaranteed to receive the Centennial commemorative hat. Coinciding with this event, ACM will be revealing their new exhibit: BMW – Propelling a Century of Innovation. LeMay – America’s Car Museum spotlights America’s love affair with the automobile. Featuring a nine-acre campus, with a four-story museum as the centerpiece – ACM is one of the world’s largest auto museums and features autos from 1906 – 1994. ACM is designed to preserve history and celebrate the world’s automotive culture. The spacious facility houses up to 350 cars, trucks and motorcycles from private owners, corporations, and the LeMay collection, which amassed a Guinness Book record of more than 3,500 vehicles in the mid-90s.